Over the years Balanced Body® has been on a mission to create the most safe, effective, and beautiful equipment in the industry – equipment that works with all body sizes, and with different Pilates disciplines. Whatever your background – contemporary, traditional, or somewhere in between – we have equipment you’ll be proud to own. A lot goes into building a Balanced Body® Reformer. Go behind the scenes and check out how we make the most popular piece of equipment used in Pilates. Music written and performed by Dan O’Connor (song #1) and Matt Giella (song #2). 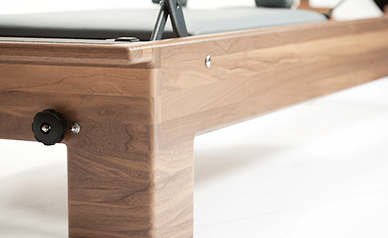 Built to last — limited lifetime warranties on, the wood frames of all our Reformers, Trapeze Table and Reformer Trapeze Combinations. Ten-Year Warranties on, Allegro Reformer frames and footbars, Ladder Barrels, Step Barrels, Wunda Chairs, Combo Chairs, Arm Chairs, Wall Towers, Springboards, Towers and Foot Correctors (excluding springs and mechanical wear parts). We use Rock Maple because it’s extraordinarily strong and durable. It has a tighter, denser, and more consistent grain than soft maple or oak. As a result, it has greater resistance to expansion and contraction from changes in temperature and humidity. That means the joints (with dowels hidden in the frame) remain strong, the frame remains straight and true and, in all honesty, it’s made to last almost forever. Learn more about our wood choices. One thing we’re proud of is how truly beautiful our equipment is. We work hard at it. Take a close look and you’ll see – every edge is sculpted and smooth – there are no sharp corners. It's appealing to the eye and inviting to the touch. Balanced Body carriages are designed for maximum stability with minimum friction. They roll smoothly and silently without rubbing or hesitating. They are lightweight, yet strong and stable. This means you are in control, not the machine. This catalyzed conversion lacquer is good stuff; hospital furniture manufacturers use it because it’s super hygienic. Plus, our extra-tough finish resists abrasion, cleaning agents, bacteria and perspiration. And it really brings out the beauty of the wood grain. High-quality springs are really important for safety. We use nickel-plated, carbon steel springs – these are the best for strength, resilience and durability. Learn more about our springs and see our standard configurations. The heavy gauge vinyl we use wipes clean with common cleaning agents and provides superior resistance to scuffing, perspiration, bacteria and stains. You can choose from 35 upholstery colors. Learn more and see all our standard and custom colors. We keep our most popular equipment in stock, ready for shipment. Stock items are usually available in black upholstery, with some exceptions. Most stock items are also available as custom orders, in your choice of 35 upholstery colors. We are also happy to build custom equipment to your exact specifications.